The NYC walking tours by Cocktails & Curiosities offer an insider’s guide to New York culture, history, bars, food and more all in an easy to use app. Cocktails and Curiosities apps are a mash up of the best of NYC walking tours featuring awesome NYC history, pop culture, movie and TV sights, music, delicious food stops, art, architecture, literature and much more all while enjoying a fun grown-up-style bar crawl along the way. NYC COCKTAILS AND CULTURE IN ONE APP! 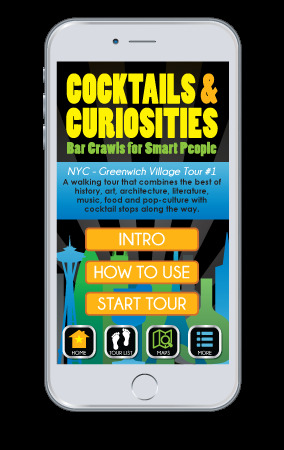 Introducing the first Cocktails & Curiosities NYC Walking Tour apps! Introducing the first two Cocktails and Curiosities NYC Walking Tours. The apps are self-guided walking tours that include stops featuring historical sights and great pop culture. You'll experience literary sights, awesome food and shopping in the neighborhood, architecture, art, music and much more. Each app is an insider guide to a specific NYC neighborhood that shows you great walking tour "curiosities" and takes you for tasty beverages along the way. The first apps are New York City walking tours but we plan to expand soon to other cities in the US and internationally! Click here for more info on the apps!